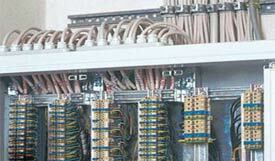 The most important cable for today's electricians are NYM, (N)YM(St)Y, NYIF-J etc. It is reassuring that European takes care that cables are always available at the right price, in the required quantity and that cable can be supplied from all 4 European stocks. Consequently there are no delays in delivery to the building-site and no extra expense incur utilizing alternative sizes. Our own transports delivers the required coils and drums immediately to the customer. The environmental friendly packaging poses no waste disposal problems.